tpdnews: Too much New Years Eve celebration ??????? 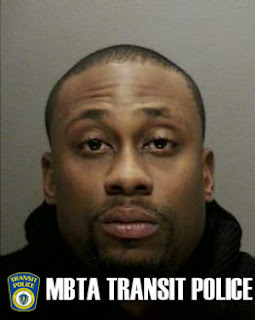 On January 1, 2014 at approximately 7 am Transit Police officers working in Area 3 received a radio call to respond to Washington Street at Dudley Street for a motor vehicle accident involving a MBTA bus. Upon arrival officers spoke with the operator of the MBTA bus who stated as she was preparing to stop for a red light the vehicle behind her slammed into the rear of the bus. Officers then spoke with the vehicle's operator, later identified as Valery D'Laurent, 26 of Marrieta, Georgia, who appeared to be under the influence of intoxicating liquors. Officers requested D'Laurent submit to a series of field sobriety tests. Subsequent to those tests officers formed the conclusion D'Laurent was operating his motor vehicle while impaired. D'Laurent was placed into custody and transported to Transit Police HQ for the arrest booking process. During this time officers discovered D'Laurent's right to operate a motor vehicle in Massachusetts was suspended due to a prior Operating Under the Influence arrest. D'Laurent is expected to be arraigned sometime today in Roxbury District Court. No injuries reported, MBTA operator evaluated on scene by Boston EMS. D'Laurent's vehicle sustained heavy front end damage which deployed the air bags.